DARE | Research Network, Inc. Many organizations within the military (and academia/industry) are involved with the development of Augmented Reality (AR) technologies which will potentially benefit and enhance dismounted soldier training. The key to Dismounted training in “augmented” environments is stimulation and memory of natural capability; muscle groups or voice. Most of the Military’s activity have been focused solely on the head mounted display with very little attention paid to the many other factors required for AR to be fully immersive for dismounted training. 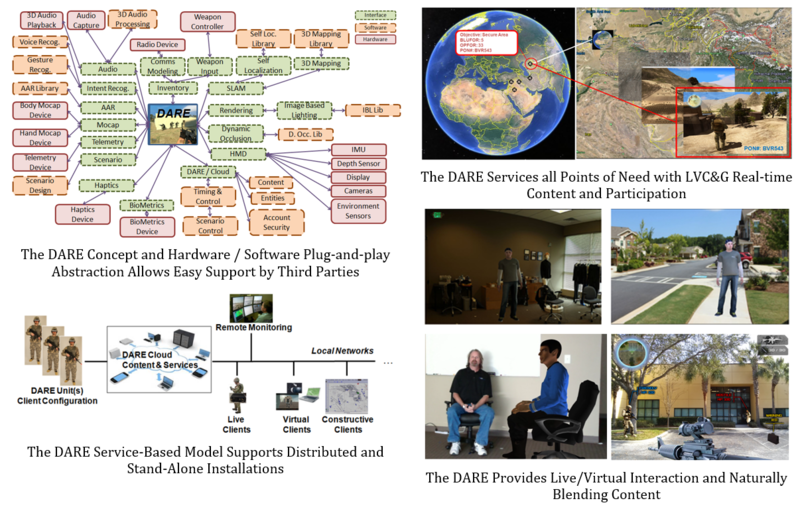 Research Network, Inc. (RNI) is solving these deficiencies by developing the Dismounted Augmented Reality Environment (DARE); a complete environment for AR implementation which not only allows integration of the latest AR technologies but also provides for service based content, live/virtual interaction, and natural blending of augmented content into live ambient environments. The DARE is unique in its design through the implementation and use of abstracted plug-in techniques which allow for third parties to easily integrate their products. The DARE also provides a complete distributed or stand-alone cloud-based service model which supports all aspects of DARE content, scenarios, after action metrics, and distributed development through the implementation of a master library. The DARE subsystems, being designed as abstracted, discrete components, can be extended to a number of markets and uses. The Wireless Head-Mounted Display (WHMD) will solve the limitations of the current market like Field of View (FOV) and usability in direct sunlight. The Integrated Combat Vest can be used as a solution for integrating soldier training equipment and tactical engagement systems while providing stand-alone soldier tracking technologies; an extension of what RNI does now in support of the Soldier Battle Lab. The Body Sensor Network (BSN) can be migrated from training into live military, commercial, and first responder applications where pose and physiological information on humans are recorded and monitored. Imagine finally realizing the ability to monitor live soldiers or responders from anywhere in the world using video game like interfaces to see what the unit sees from any perspective and the units actual representation, biometrics, fatigue, and pose instead of just icons and symbols. Demonstrated VIKENG system (wired) with an arbitrary weapon attachment. Location and Sensor-less Weapon/Item. Illustration of using the world boundaries to impact RF radio communications in the live exercise. Illustrates how the CommServer live soldier telemetry network is in use at a current dismounted training site (Urban). Illustration of NPC wounding / healing (TC3) system for combat medics (dual dismounted role) including attach/drag to safety. Illustration of Occlusion Scenarios in Augmented Reality (AR) with DARE. DARE Master Library allowing different COTS units play nice together. VIKENG (Rev 1) with motion capture and Virtual / Live Locomotion techniques.